Today I’m excited to announce a new app I’ve been working on in my spare time called Basic Weather. Basic Weather is a daily weather app that matches the weather to emotions using animated GIFs. It’s a fun, useful way to start your day. You can download it for free in the App Store here. This is a quick story of how it came to be. In the summer of 2008, Apple launched the App Store. I was a new graduate with a BS in art and computer science, so this was exciting news. My heart leapt at the possibilities. The prospect of building an iPhone app was daunting. We used Java in school and I had played around with this thing called Ruby on Rails, but Objective-C had that weird bracket syntax and manual reference counting made my head hurt. And XCode was a puzzle box. But I was spending my days under the buzzing fluorescents of a plush grey cubicle doing technical support for .NET libraries. I really needed a place to channel my creative energy. I fell in love with the idea for an app I called Plog. The name was a portmanteau of “poop” and “log” and a bastardization of the onomatopoeia “plop” and also a play on the word “blog”, all of which I found very clever. Plog was to be a poop tracking app that would encourage you to log your bowel movements, noting where they fell along the Bristol Stool Scale. The scale describes a spectrum of poop classifications, from Type I (“separate, hard lumps”) to Type VII (“liquid consistency with no solid pieces”). When I described my vision for the look and feel of the app to friends, I used the word “classy”. Why a poop tracking app? I was intrigued by the contrast of high brow and low brow, and exploring how the app’s serious aspects mingled with the absurd. I’m generally fascinated by bodies and how they are both disgusting and beautiful. I took inspiration in the work of artists like Tim Hawkinson, who has used his own toenail clippings in his sculptural work. Around this time I remember keeping a Photoshop file that documented the various hues of my urine. It seemed important. In the evenings I stumbled through building Plog. When you opened the app I designed a digital facsimile of a leather-bound journal embossed with a ceramic toilet sitting at the center of a burst of light beams. The pages of the journal delicately fluttered open to reveal the main interface. It was 2008 and skeumorphism was hot. Though, I didn’t get much further. I lost interest after an app called “Poop the World” was released, and mostly didn’t touch mobile apps for a long time. The idea for Basic Weather began in early 2016. It was dark and cold in New York. I was separated from my wife and living out of someone’s spare bedroom in Bushwick. I was very lonely. Most of my free time was spent thumbing through dusty philosophy books in the basement of The Strand or in coffee shops sipping cappuccinos while eavesdropping on the conversations of strangers. I went to a lot of movies by myself. Basically anything to stay busy, because the dingy violet walls in that dimly lit bedroom threatened to absorb me. And so it started with some changes in my routine. For the first time in my life, I started going to bed early and waking up early. Nights were depressing, but the mornings were better. I’d try to be in bed by 10pm and out of the apartment by 7am. I’d head for a local coffee shop and often I was the first one there. This gave me about two hours before I’d brave the L train and soldier into work. Let me say that I’ve lost count of the number of projects I’ve started and never finished. My hard drive is a sad graveyard full of folders with names of projects that will never see the light of day. I often beat myself up about this. But my side projects, however ill-fated they may be, have kept me sane. They’re safe places that only I control, despite whatever is burning down around me. And I’ve learned so much from them. Sitting in the Swallow Cafe one cold morning I decided what I was going to do. I was going to build a weather app using React Native. I’d been using React Native at work to prototype designs internally for Meetup’s new mobile app. I’d grown deeply in love with the framework, as much as one can be in love with a clever pile of bits. A “basic weather app” seemed like a good excuse for a first date. I didn’t grow up dreaming about being a weatherman, but I’ve spent the last year meditating on the weather and how it affects us. The weather is something rare in our modern world. It has a massive impact on our lives but persists in its utter reluctance to be controlled. Humans are the great tool builders, and all of our technology manifests out of our desire to control. Today I took a pill to tame my anxiety. My wife took a pill to keep new life from forming inside her womb. We have these devices for so many things but the weather resists submission. No one can pay to change it and it doesn’t discriminate. It’s a shared experience back through time — we cope with the weather in mostly the same way as our ancestors did. And it’s emotional. The oscillating patterns reflect and influence our own emotional rhythms and behaviors. Imagine the hazy high of a summer day. The cozy warmth of a fire on a winter night. The panic of being caught in an unexpected downpour. The awe of a vibrant sunset. And this became the product’s guiding light: that this weather app should distill the emotional quality of weather down into a beautiful, fun experience that didn’t just predict the weather, but that mirrored the way the weather made you feel. There were many months between that winter morning in the coffee shop and today. Making Basic Weather has been an exercise in persistence and patience and the resonance of incremental wins. It’s summer now. My wife and I are better than ever. Soon I’ll share more stories and things I’ve learned along the way. But today I’m so happy to share Basic Weather with you. You can download Basic Weather for free in the App Store here. 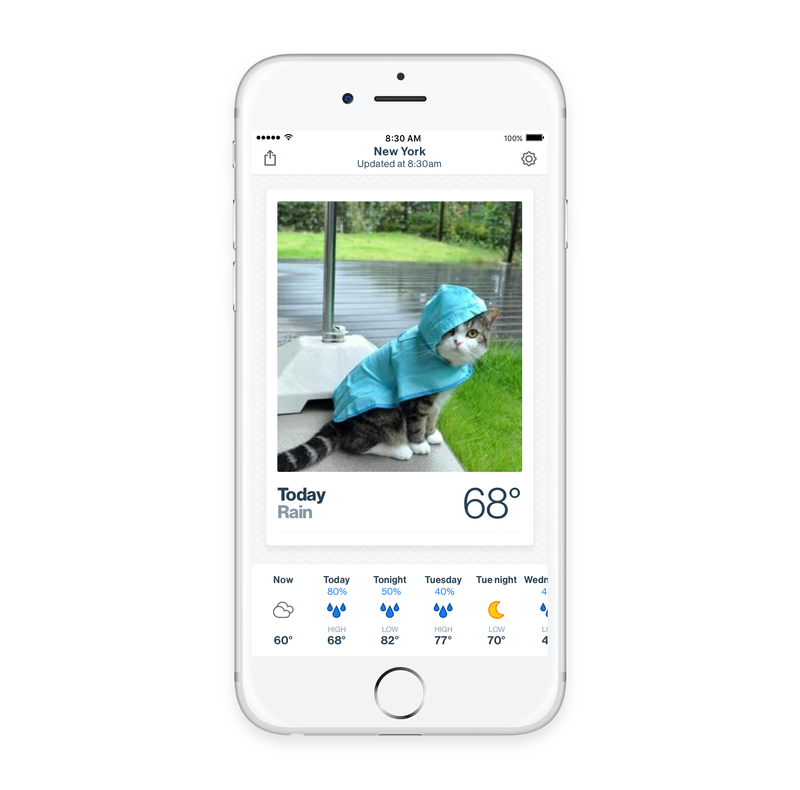 Stories and updates from the Basic Weather app.